Innova Corporate (India), We are one of the leading Exporters, manufacturers in Assam, Suppliers and Dealers of RO Antiscalants from delhi based, we deals in finest quality of RO Antiscalants in Assam, manufacturers of RO Antiscalants, dealer of RO Antiscalants, suppliers of RO Antiscalants, RO Antiscalants, RO Antiscalants manufacturer in Assam, RO Antiscalants Suppliers in Assam, RO Antiscalants dealer. RO Antiscalant merges variable products which we cater such as RO Antiscalant (High pH), Antiscalant Chemical, Membrane Antiscalant, RO Antiscalant Chemical. Using RO antiscalant helps to control inorganic scales of calcium, magnesium, barium, stronium, fluoride, iron and silica. RO antiscalant ensures above 80% reduction in scaling tendencies if used continuously. Innova's RO antiscalants are very effective antiscalant for waters with langelier saturation index upto +3, iron upto 1.4ppm in reject, silica upto 175ppm (or mg/l), high sdi. RO Membrane Antiscalant is compatible with coagulant mpt 150. Ro antiscalant keeps reverse osmosis system capacity close to design, and minimizes shutdowns and membrane cleaning cost. It aids to minimize the risk of scaling and eliminates disastrous effect on the use of hazardous acids, resulting in efficient plant operation with highest possible conversion rate. 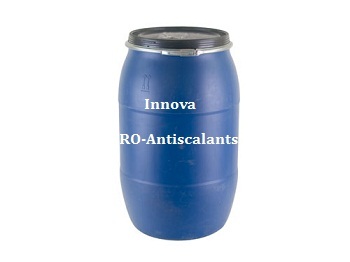 RO Antiscalant, offered by Innova Corporate (India), is effective in dwindling scale formation in presence of foulants like Sulfate salts of Calcium, Calcium Carbonate, Barium, Strontium and Magnesium, Calcium Fluoride, Iron and Silica. Antiscalant for Reverse Osmosis is invulnerable in handing and use with a very high recovery rate of membrane. It is effective at low Chemical dosage and hence economical.